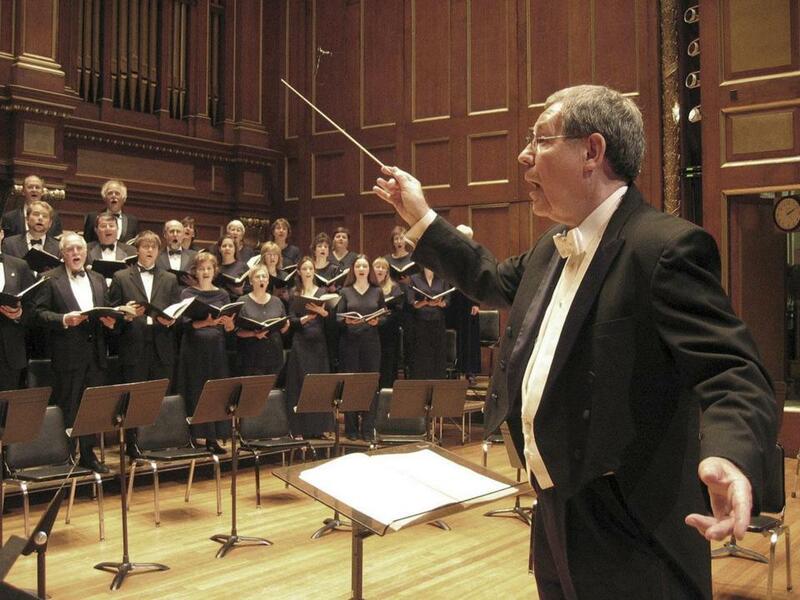 Conductor Donald Teeters (pictured in an undated performance) led combined forces of the Boston Cecilia and Musica Sacra on Sunday at Jordan Hall. With its double orchestra, double chorus, and half-dozen or more vocal soloists, J.S. Bach’s “St. Matthew Passion’’ is not an oratorio so much as a monumental passion play in which the soloists and choruses, in recitatives, arias, and chorales, agonize over the Gospel narrative as related by singers representing the Evangelist, Jesus, Peter, Judas, Pilate, and others. Its vast time scale (some performances have run close to four hours) is framed by two great outbursts, the first, “Kommt, ihr Töchter, helft mir klagen,’’ a back-and-forth between the antiphonal choruses, the second, “Wir setzen uns mit Tränen nieder,’’ a minor-key lullaby for Jesus - for all of us, really - that, in triple time, dances like a sarabande. The piece is so closely tied to Holy Week, it might seem an odd choice for November, but the performance by the combined forces of the Boston Cecilia and Musica Sacra, conducted by Donald Teeters at Jordan Hall Sunday afternoon, proved - if proof was needed - that it’s a work for all seasons. That opening “Kommt, ihr Töchter’’ could have been more crisply enunciated, and a hitch caused the beginning of the “Am Abend, da es kühle war’’ recitative to be restarted, but there was little else to quibble with. Teeters’s reading proved a consolatory one, penitential rather than anguished. Tenor William Hite was a fervent Evangelist, bass Ronald Williams a deep-voiced, knowing, reassuring Jesus. The vocal quintet - soprano Jolle Greenleaf, alto Thea Lobo, tenor Aaron Sheehan, baritone Bradford Gleim (who also sang Peter), and bass Robert Honeysucker (who also sang Pilate) - provided drama without melodrama; Lobo was particularly affecting in her “Erbarme dich, mein Gott’’ aria. The two choruses didn’t want for bite when it was called for (as when they spit out “Sind Blitze, sind Donner in Wolken verschwunden?’’), or for majesty and beauty in the chorales. The two orchestras played with energy and intensity; there were polished solos from, among others, Danielle Maddon on violin (backing Lobo’s “Erbarme dich’’) and Laura Jeppesen on viola da gamba, and the oboe section gave individual coloration to Bach’s writing for oboe d’amore and oboe da caccia. As sublime as the “St. Matthew Passion’’ is, performances have been known to drag. This one, at three hours and 20 minutes (including one intermission), had angel wings.